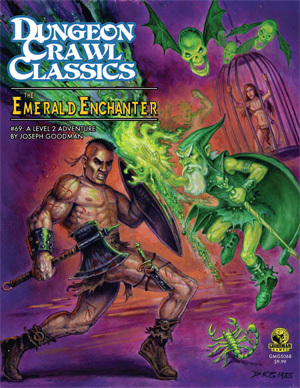 I found this publication at the bottom of the DCC 3rd party products pile, so I suspect that it was one of the first things that got the thumbs up from the Dark Master to be published under the "Compatible with DCC RPG" seal of approval. When I was but a speck of dust in my home plane, 'zines were everywhere (the Phlogiston was not used then, kids [it means the Internet]), written by nearly everyone, typed and stapled manually, and then sent by mail or sold in comic-book shops or in even stranger places. So it's a comeback, then; even though you can get it from the Crawl! web page in physical form, it's also available as a magical simulacrum (a pdf). The Reverend Dak and some of his home campaign players are the authors of both the written content and the art. He's got a small publishing house, Stray Couches Press. It's also worth of note that he accepts submissions for this fanzine, which nonetheless remain property of their creators. Reverend Dak, as you probably know, is nowadays helping Goodman Games with his editing skills. I love it when humans are sincere; Dak states that this is "a fanzine published by fans for fans". It's a compilation of house rules, no more, and no less. 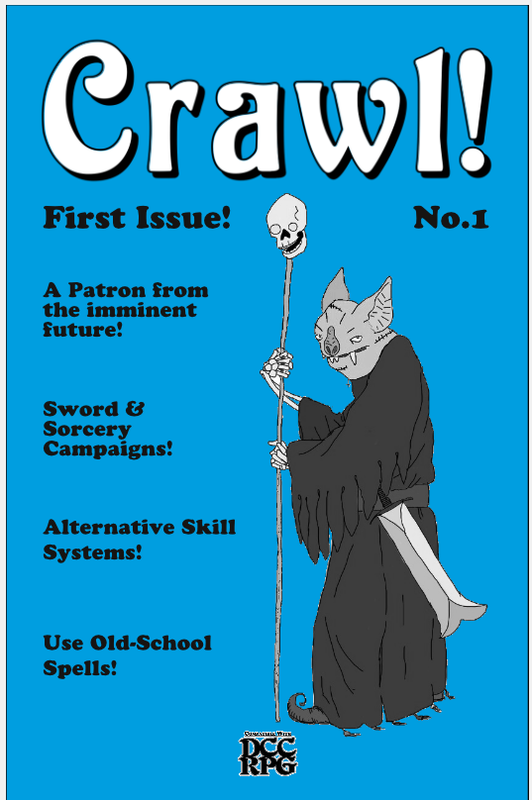 And it's a very complete issue, I can tell you that; rules for a cleric- and thief-less campaign; a new patron (alas, the patron spells and spellburn are not on this issue); alternate rules for the common but sad time when a character arrives at death's gates; a quick guide to convert OSR spells to DCC; and a variant to the skill check system. Crawl! 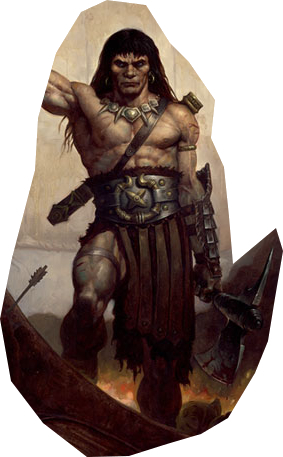 No.1 brings DCC even closer to the source material by removing the cleric and proposing alternatives for handling the healing needs of a party; it also offers the possibility of ditching the thief, since adventures are generally known for their thieving capabilities. Needless to say, the demi-humans would also go over the board. 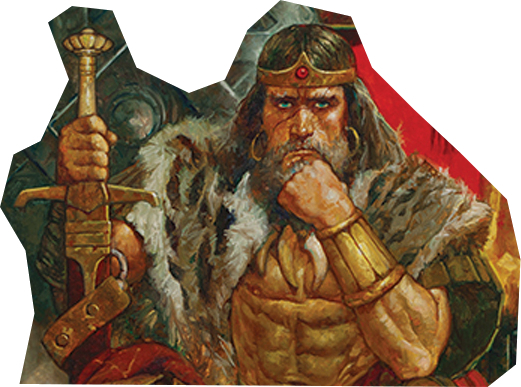 Van der Danderclanden, the new patron, stems from a great and amusing idea: your future self, a wizard of great power, travels back from the future to ensure that you follow the right path. I'd say that some of the invoke results seem a bit powerful, alongside with some of the taints. Illos are quite good, even more considering that this an amateurish product. And my good masters own the black cover version, which resembles a small companion to the black DCC RPG manual. I'll put it next to it on the shelf. 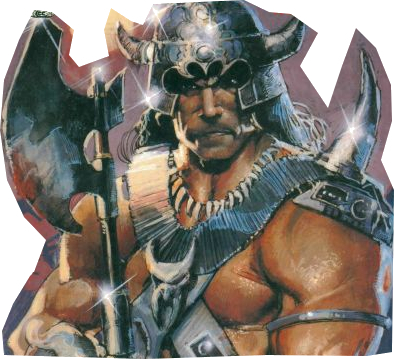 For all these reasons, I find this to be a King Conan (4 out of 4 ) issue. Leiber would proud of it. 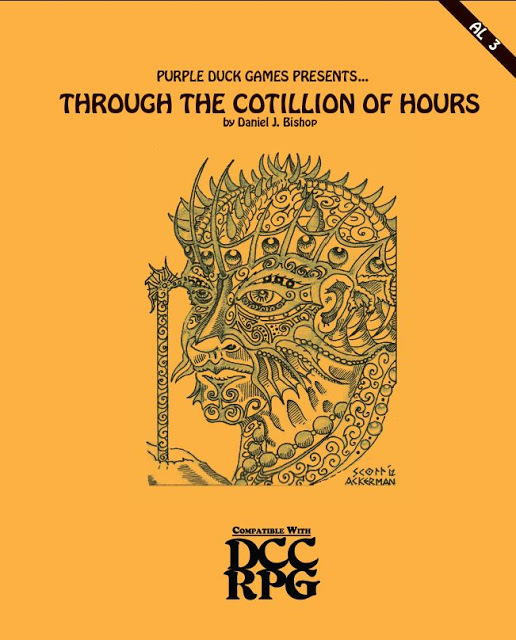 Purple Duck was one of the first publishers to take advantage of Goodman Games' license, and to date, Daniel Bishop is probably the most fecund 3rd-party writer for DCC, and one of the best. I thought you should know that, 'cause I'll be sorting all of his work, and I don't like to repeat myself, it robs me time from reading. The booksellers asked me to tell you, dear reader, that this is plagued with SPOILERS. This adventure, or "Adventure locale" as Purple duck calls them, takes place in the dream lands. It is called a "locale" because it's circumscribed to a place, the palace of Somnos, the dreaming god. And the hook is as easy as it's effective: the PCs are dreaming, and they all are invited to join Somnos' ball. If they get to him, they know that he'll be able to grant them a wish. As you may imagine, things can be a little different in the dream lands. To start with, Somnos' mansion is full of dream analogues of the PCs, and depending on the mask they wear, their attitude and effects on the PCs can be completely different. This is both entertaining and evocative. There are some rules there concerning what happens to the analogues when PCs move around that seemed a bit confusing, but it's a small thing. To follow with, the PCs won't get much time to visit the palace; there's a "time limit" that hinges on the way the PCs move around the mansion. The "physical" representation of this is the sound of a chime; when it happens 12 times, the PCs awake and the visit is over... for the time being. Yes, this is a recurrent dream, and it can be completed or attempted another time at a later occasion. Nice mechanic, easy and convenient. Inside the mansion, they'll find a series of rooms full of oddities that manage to evoke a dreaming imagery, I can assure you that. Here Bishop makes good use of Lovecraft's legacy, in particular from his dreamlands stories, with some "easter eggs" concerning characters and details from said stories. The rooms pose puzzles or hide traps, and are basically in the PCs' way to get to the place where Somnos lies. And careful what you wish, it may become true... or make Somnos blast you out of existence. Illos (cover and interior) are by Scott Ackerman. His style is very personal, and I really think that it fits perfectly the mood. Ackerman's work is distorted, wavy, with clean black lines. Dreams and dream-quests are a common theme in fantasy literature, but I don't think they're used well enough. This adventure manages to do that. 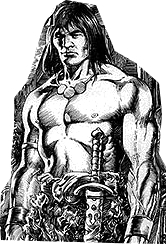 This a King Conan (4 out of 4 ) adventure. The Appendix-o'-meter almost exploded. It's been a while since we gave away something (since the only time we did it, actually), so here we go again! In this occasion, though, it'll be a draw; there's already enough competition and strife in this world. Flying laser-shooting skulls. 'Nuff said. We're in no hurry; let's choose Halloween's eve as the deadline for this. And after lady Luck chooses a winner, we'll publish all the adaptations we received. Don't be shy! Send them in! It might seem that here at Phlogiston Books we've been idle for the summer, but nothing farther form the truth! Our next publication is in the works, and although we can't set a date yet, we can disclose (hehehe, "disclose") that it'll be a collection of various useful articles, including (but not limited to) a new patron. Yeah, I can hear you, "a new patron?! We're already waist deep in patrons, for Bobugbubilz's sake!" Well, not like this one. It suits perfectly well the kind of campaigns that we'd like to promote from this humble house... a "tone" that is also present in the other entries. "But that's a 'zine, then", I can also hear from some people. No, not really; a 'zine entails some form of periodicity, something that we can't and won't promise. Blood falls from the wizard's eyes. If you get this result a second time, the wizard loses an eye, that will fall to the ground leaving behind a bloody eye socket; its wounds will never truly heal. If you get this result a third time, the wizard loses the other eye. A raven will then fly to the wizard's shoulder. 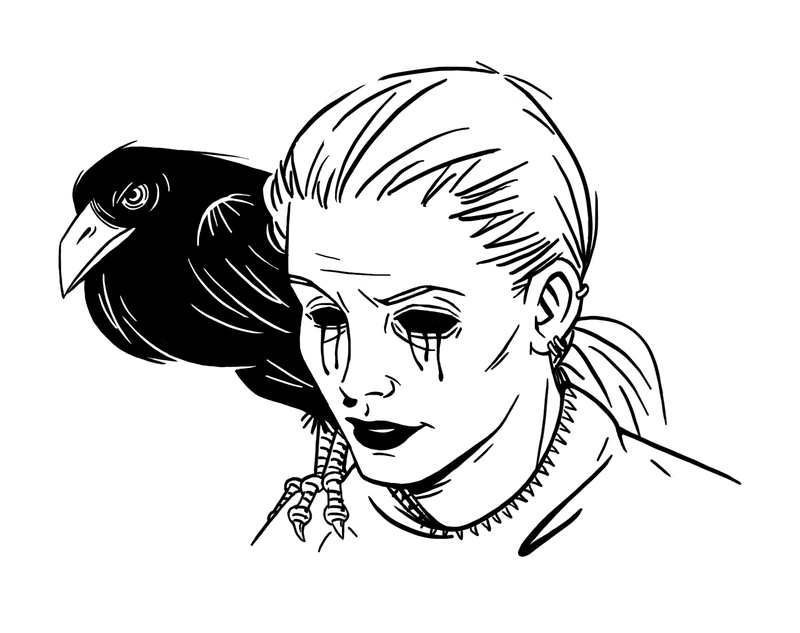 From then on, the wizard will be able to see through the raven's eyes; it will always stay with the wizard, pecking at his bloody eye sockets from time to time. If the raven ever dies or is taken apart from the wizard, another one will appear to take its place. Illo by the great Manu Saez; you can find more of his works here. Stay tuned!